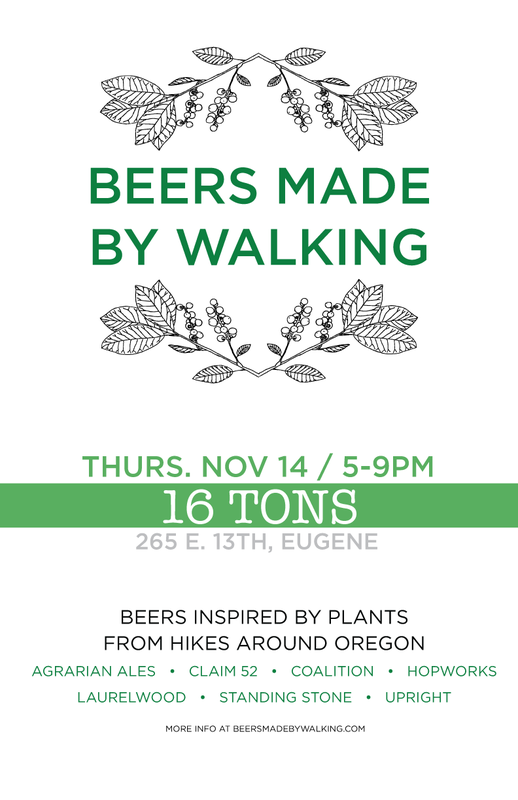 Two of the breweries that participated in this year's Oregon-based Beers Made By Walking are from Eugene. We didn't want Eugene to miss out on the BMBW action, so we decided to round up a few of the delicious beers from last weekend and send them down to 16 Tons for a special tap takeover. Each beer in this program is inspired by plants found on nature walks in Oregon. Check out our series of sneak peeks that we've posted, along with the exclusive preview on the New School for further details about each beer. A portion of the proceeds of this event will be donated to Nearby Nature, a non-profit organization in Eugene that is dedicated to getting children, adults, families, and teachers outdoors for nature walks, day camps, restoration projects, workshops and more. Claim 52 Brewing (Eugene) - Gose Coastal - Gose with yarrow, racked onto Oregon huckleberries, and served with a side of Porcini salt.